Jonjo O’Neill is a former jockey turned trainer. He had great success in the saddle and is best known in the training sphere for having runners under the J P McManus green and gold silks. Twenty time champion Tony McCoy had ridden hundreds of winners for O’Neill before retiring this year and holds him in high regard. The diminutive Irishman has trained some high class animals, as well as some more moderate ones, and he is known for lining his runners up for gambles. Whilst primarily operating under National Hunt rules, he does have the occasional flat runner. In this article we take a look at Jonjo O’Neill’s runners under a range of conditions. Infact, O’Neill’s favourites in April-July are 40/69 (57.97%) in novice hurdle company, which is a staggeringly good record. Their overall strike rate is the highest at this time of year, and the returns are positive in each month. Impressively, O’Neill has produced an A/E of 1.00 or more with his handicap hurdlers in 11 of 12 months. The only time he underperforms market expectations is in March. This is the month when the ultra-competitive Cheltenham festival is on, and O’Neill’s strike rate drops significantly at this time of year. He does especially well in the Spring and early Summer, with very strong results in June. His last time out winners off for a break of 15-90 days exceed market expectations; 61/240 (25.42%) for £55.81 LSP, giving an A/E of 1.30. Those that are turned out quickly (within 2 weeks of their last success) just slightly underperform market expectations and produce losses. Although he has many more runners over 2miles 3f, his strike rate is better, returns are comparatively better and the A/E is positive. The lower the race class, the higher the strike rate. 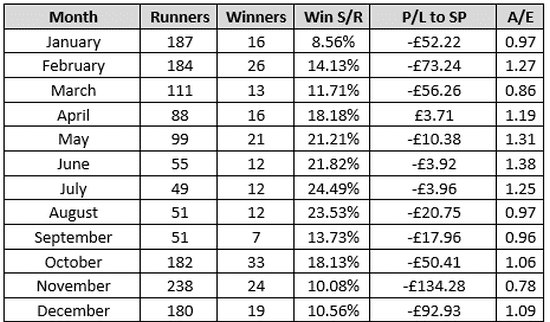 O’Neill does comfortably the best in Class 5 company, with a 21.45% strike rate, and his runners win nearly 40% more often than they are entitled to based on odds. Class 5 is the lowest, and generally least competitive grade and this is where shrewd race planning can be effective. O’Neill’s novice hurdlers excel in April-July, especially when they are market leaders. His handicap hurdlers do poorly in March, but produce A/E’s of 1.0 or over in all other months of the year. They have an especially good record in June. 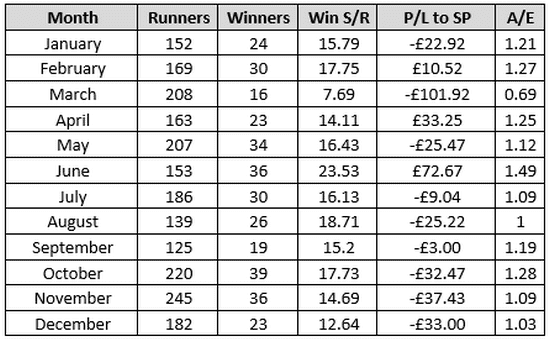 Jonjo’s last time out winners in handicap hurdles do well when off for 15-90 days. Those horses who did not win last time out in handicap hurdle company do better the faster they return to the track. Unlike his hurdlers, Jonjo O’Neill’s handicap chasers do well in March. They struggle from September-December. His handicap chasers do better over longer distances. 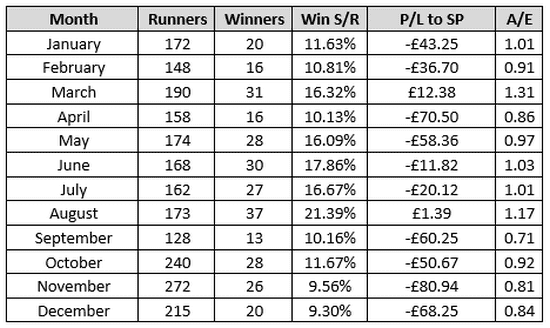 O’Neill’s handicappers in Class 5 company are very profitable and are worth following.